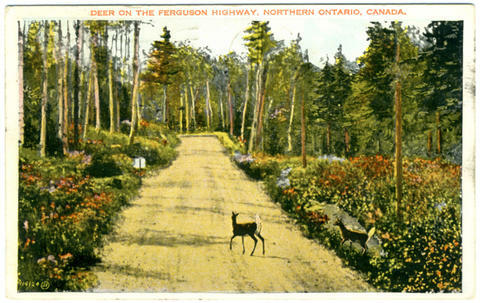 Item 022 - Deer on the Ferguson Highway, Northern Ontario, Canada. Published by Valentine-Black Co. Ltd., 11 Duncan Street, Toronto. Attributions and conjectures: 114/24 JN on the front suggests this image was by John A. Noel. Postcard was cancelled North Bay, Ont., 22 July 1936. Card addressed to: Mrs. A. B. Cornwell. St. George. Ontario. Canada. Message reads: Dear Mother. Arrived here at 3:30 am very tired, saw the Quints in the rain, rained all afternoon. Haven't got our cabins yet in city of North Bay. Sending cards to the others from here. Very rocky country up here. Love Grace. [added on top left] We saw a forest fire & drove thro smoke. Drove very fast all the way up.